Why did the court deny their request and decide not to award the company any restitution? Did they say? Great story. Regarding fraudulent relic cards I have one here I would really like explained. I pulled a Manny Machado Laundry Tag Relic 1/1 out of 2012 Topps Museum. Beautiful card but I have no clue where the tag came from. The tag says 2011 MLB All-Star Game Chase Field, Phoenix Arizona. The issue at hand is that as far as I know he was never even remotely involved in the 2011 MLB All-Star Game. In 2012 he was involved in the All-Star Futures Game and played in the 2013 All-Star Game, but no involvement whatsoever in 2011. I’ve reached out to Topps multiple times and no answer, ever. Enclosed is a pic. I’d love to know what you think. Machado was definitely part of the 2011 Futures Game. bignugs, Google is your friend. Search it. It’s truly an honor that America’s greatest athlete would be the subject of America’s greatest frauds. Thank you Barry and REA. I’m told they didn’t award any restitution because the evidence suggested that what the dealers were alleging was true. Manny Machado was indeed on the All-Star Futures Game roster in 2011. That tag is legit. Shouldnt Panini be issuing a total recall on all Thorpe relic cards made from that jersey? How would that work? They would probably have to issue a press release. It’s not the first time the words “Russek” and “Scandal” were used in the same sentence. 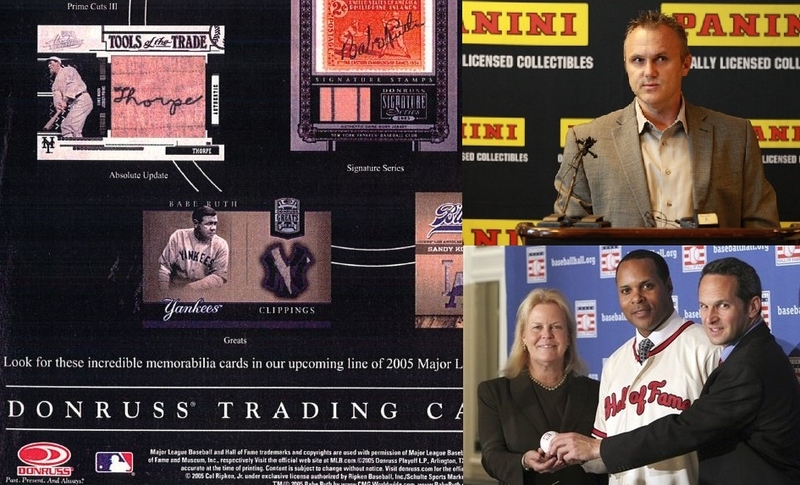 I’m sure this is just the tip of the iceberg on memorabilia relic cards. Great research once again, keep up the great work! As the author of Jim Thorpe – A Biography (McFarland & Co. Inc., 2011) I am not surprised that Jim Thorpe is still being hustled. He was hustled all of his life. Hustled by Pop Warner, hustled by John McGraw, the National Football League, MGM, Warner Brothers, Avery Brundage and the American Olympic Committee. Thorpe’s corpse was even hustled by his second wife Patricia and sold to a Pennsylvania community. So I am not surprised that Jim Thorpe is still being hustled. RIP in Jim Thorpe – if that is ever possible. 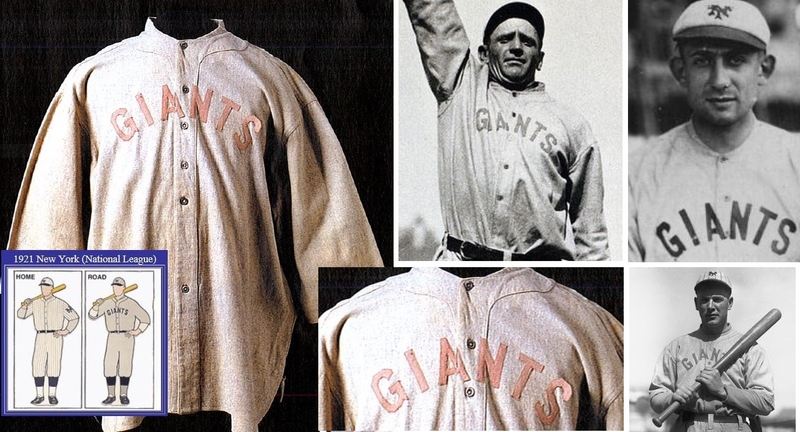 There is absolutely no authenticity problem with the Jim Thorpe jacket that was used to create the “jacket-cards.” I recall when it was auctioned several years ago, I thought by mastronet. It came directly from the family and was an incredible piece. Also, it is much more difficult currently to create a jacket of any quality from scratch and the jacket itself is incredibly rare (I’ve never seen another) so to transfer it to Thorpe would be unlikely and lot more difficult than you might expect. 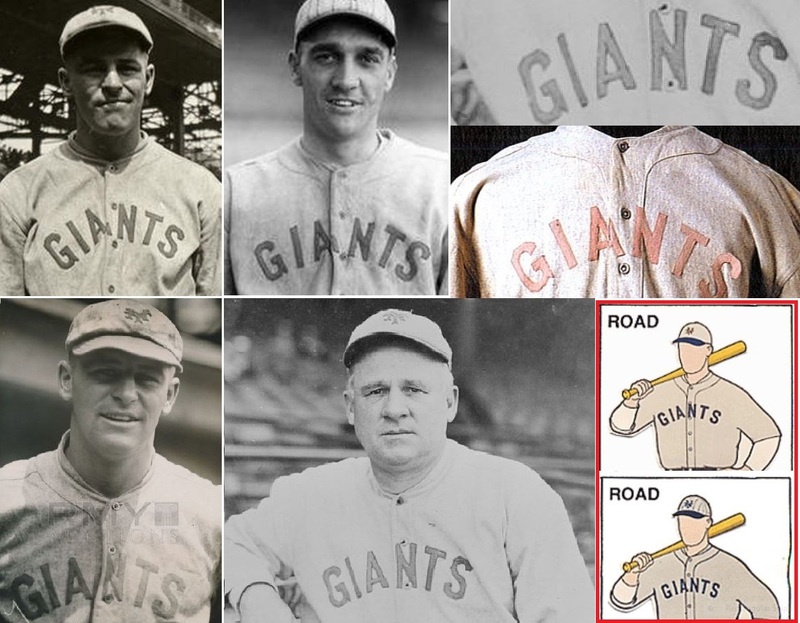 But the proof is in the pudding and it reached out to everyone at the time as 100% as opposed to the Thorpe jersey which was an obvious fake based on the name in the collar which was amateurish and probably the work of Pug Winkler. Ironically, I was truly upset at the time when I saw the jacket had been cut up, a great loss historically. But I should not cast stones on the practice as my firm Lelands.com sold many pieces in auction and privately to the card companies many years ago. Usually they were poor specimens and in many cases the little collected and far less desirable pants versus jerseys. But when one of our Babe Ruth jerseys (yes a real one btw) was cut up it made us sick. But it’s a public auction and this is America last time I checked. I am disgusted to learn that the Thorpe cuts are not genuine. I purchased thousands of dollars in cuts. I emailed panini requesting them to purchase the cards back from me and asserted that if they send a generic email response it would be taken as a rejection to settle and that I would be pursuing legal action. I have not heard back a single word from them on their guarantee. Looks like I may be doing the clean up work for everyone soon. Thanks for the heads up and I may be calling you guys for assistance in testifying to clean up this mess. Just checked ebay on December 22; a 2005 card is offered for 150 dollars. Noticing that all the game worn Thorpe baseball jerseys are slowly disappearing on eBay. Lowest one without an auction is now $150.00. They used to be under $100. Wonder if they are being bought and destroyed. ??? Wow…wow! I keep researching this and makes me sad at how big this is in the realm of the industry. Just read the statement submitted by the fbi. How about the fbi report that said that a buyer for a card company was sleeping with the seller of the fake crap. Does this ever end!! Like they hope the consumer just forgets…..if a restaurant is caught selling fake steak…or improper amount in their high end products..would you keep going there…like a cycle of abuse if I ever am that ignorant in my trust again. What’s “All American” about an Italian company? 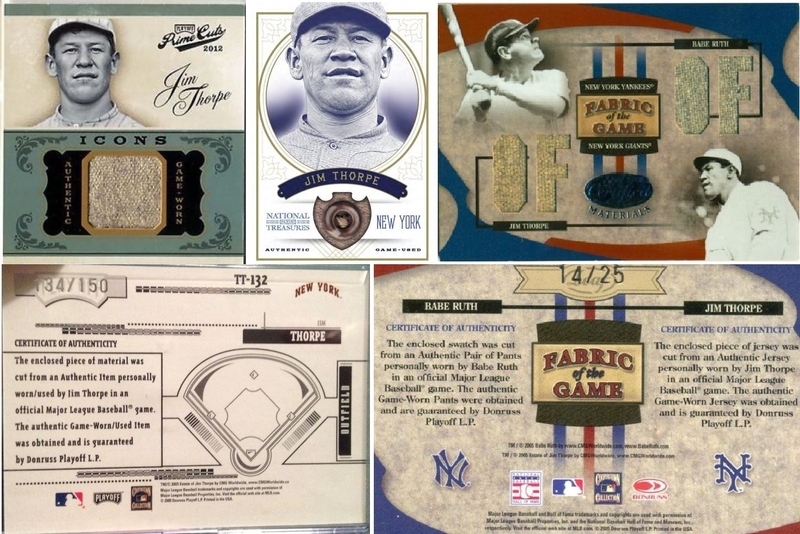 As of February 2015, the bogus Jim Thorpe relic cards are still selling on eBay–one such 2011 Panini Prime Cuts card recently sold last week for close to $400. Completely disgusted. I just purchased one of these as a new jump start to my HOF pc. And I find out its fake…….